Open plan layouts are perhaps the most common decorating challenge for the modern home designer and decorator. Sure, a combined kitchen, living room and dining room can feel bright and breezy, but it can also get really messy in aesthetic terms. Ideally, your open layout will have a nice sense of flow AND some sense of boundary between the various living areas. So how can you strike this magical balance? Well, today we'll present 7 homes with open plan layouts that show how you can do that with line, colour and a careful choice of furnishings. Let's check them out! 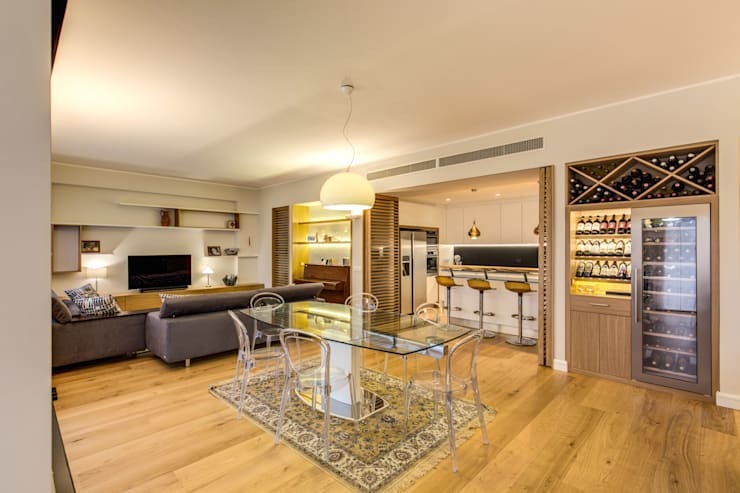 The interior designers and decorators of this elegant modern apartment have used a careful balance of grey areas to connect the living room, dining room and kitchen area. The grey carpet forms a visual boundary around the living room and the slate grey wall gives the living room its own distinctive feel. A two-sided bookcase is an excellent choice of dividing for a small apartment. Here we can see how it can be used as a media unit and a display cabinet. The open design also allows light to flow throughout the room and helps maintain that bright breezy feel. Note how the black panel ties in with the black kitchen countertop and the high black panel on the living room wall. This modern antique-style home has an incredibly eclectic combination of furniture pieces. Although there are no obvious connections between the various elements, it still feels polished and complete. The secret we feel lies in the soft golden colour palette and the fine lines that connect the wood joinery, delicately patterned oriental rug and the fine modern lines of the bookcases. 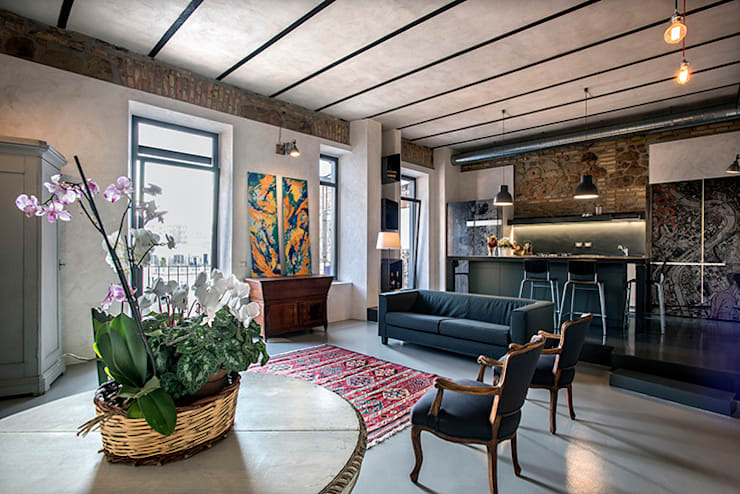 This inspired interior has a combination of antique furnishings and a bold use of black. The black certainly holds the design together, but what really has our attention is the platform. It neatly separates the kitchen from the living area without blocking that open sense of flow between the two spaces. An awkward living/dining/kitchen like this is certainly a challenge to furnish. This is where a smart corner sofa can really come in handy. It makes the little corner area feel instantly cosy and it keeps the walkway nice and clear. The back of the sofa is commonly used to separate the living area from the kitchen. Those who don't like the look of 'floating' furniture might want to push a side table up against the back of a sofa. 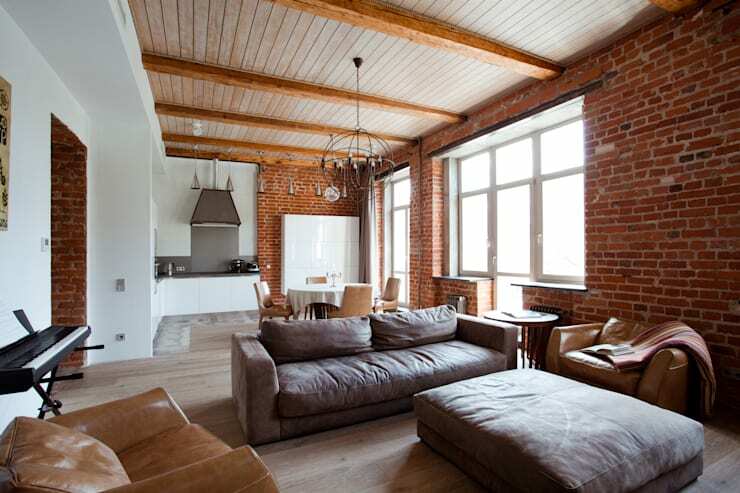 In an apartment with magnificent exposed brick walls like this, it makes sense to play up the brick tones with an earthy coloured sofa. Many modern kitchens have lots of grey chrome or steel on display. This can be tricky to incorporate into the greater colour scheme of the living area. A good solution is a smooth grey sofa like this. 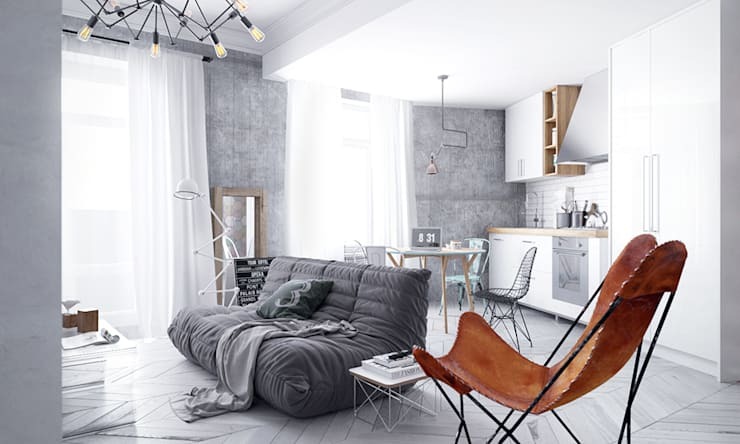 It looks super comfy and it certainly works with the grey and white kitchen. 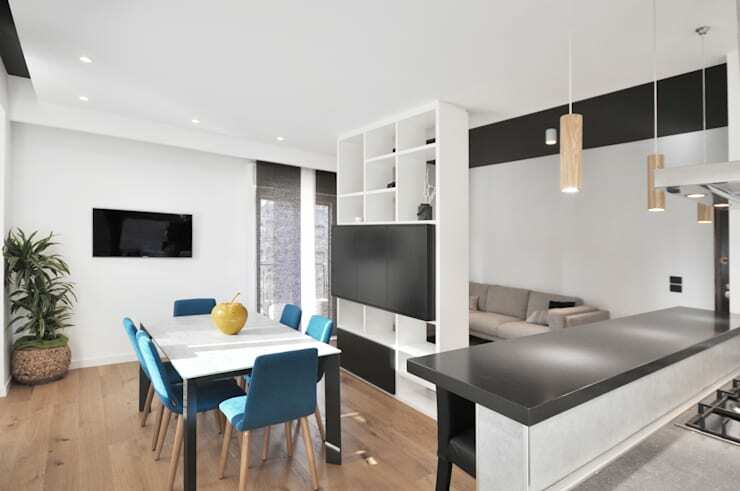 For more home layout ideas, have a look at this project: How this 50m² apartment feels bigger than it is. 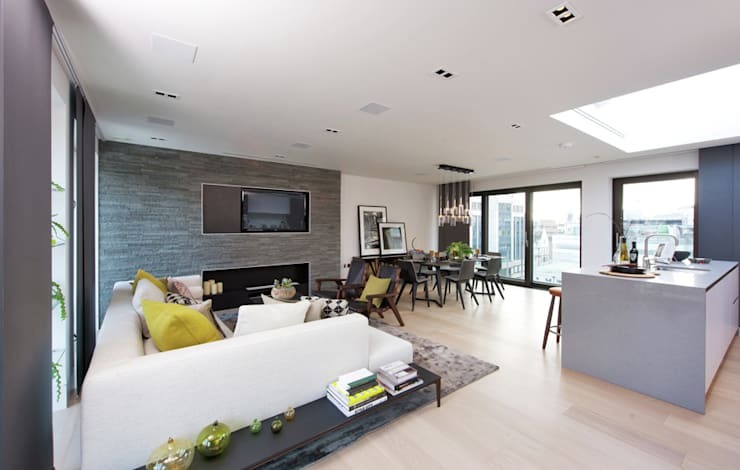 Which of these open-plan layouts do you like?